The EURCOM Panther 5 and EUROCOM X7 are ultra-high performance systems with no performance or security compromise. Both support up to two graphics processors in SLI or CrossFireX, as well as Quadro, while the Panther 5 supports the most powerful desktop processors on earth, while the X7 supports the most powerful mobile processors on earth combined with Thunderbolt technology. Trusted Platform Modules are supported to provide a fundamental aspect to IT security: the root of trust. Embedded into these systems, the TPM provides a proven, safe foundation for more secure computing. “Video game design teams from all over the world require the highest possible graphics cards such as dual NVIDIA GeForce GTX 880M cards combined with TPM chips for security in a single, mobile system with Thunderbolt technology. We are seeing a great deal of interest in the EUROCOM X7 and EUROCOM Panther 5 from game developers who need a secure, mobile system with the capability of their desktop” Mark Bialic, Eurocom President. The EUROCOM Panther 5 and X7 are enterprise class system for professionals creating, studying and manipulating sensitive information, because of this security is essential. Eurocom equipped the Panther 5 and X7 with Trusted Platform Module 1.2 (TPM), finger print reader and Kensington lock port. Many of our customers utilize their EUROCOM Panther 5 and X7 system for game development, engineering, design, software development and other activities that involve valuable intellectual property information. Due to this, we feel the need to provide them with the utmost in secure computing to keep their information and livelihood safe and secure. Eurocom offers professionals, gamers and enthusiasts total control of their fully customizable EUROCOM X7; single or dual NVIDIA GeForce, Quadro or AMD Radeon graphics can team up with an optional 32GB of DDR3-1600 RAM, Intel Core i7 Extreme Processors, RAID 0/1/5 capability with SSD, HDD and mSATA support to create blazing mobile performance. The EUROCOM Panther 5 is a workstation and server class notebook with support for Intel Core i7 4000 and Intel Xeon E5-2600 v2 processors, up to I7-4960X Extreme Edition and Xeon E5-2697 v2, 6 Terabytes of storage support, 32 GB DDR3-1600 support via 4 memory modules, RAID 0/1/5/10 and a 1 hour battery life. The EUROCOM Panther was awarded the 2013 Intel Form Factor Solution Innovation Award for delivering the most innovative mobile solution based on Intel Technology to meet our customers’ demands for mobility. Eurocom corporation successfully conquered the challenge of, packing an appropriate amount of processing capability, storage capacity, memory, and back-up battery into a sub-12 pound form factor, by outfitting a desktop replacement chassis with the highest quality components, including the Intel® Xeon® processor E5 series, Intel® S3700 solid state drives and 32 GB memory – chosen for their ability to support both workstation and server-class operations. 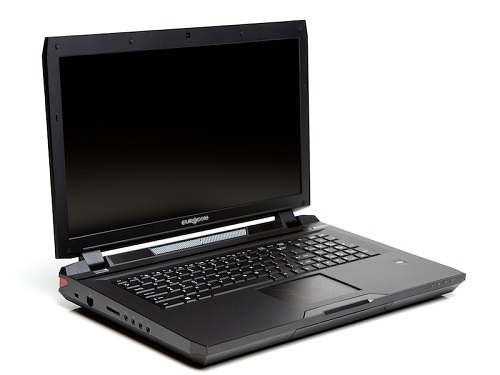 The EUROCOM Panther super computer has the performance capabilities of a datacenter server in a portable form factor, complete with workstation tools such as keyboard and monitor. Solid State, Hybrid, or Enterprise level drives with RAID capability are supported in the Panther. With support for up to four 1.5 terabyte storage drives, the Panther is able to offer 6 terabytes of storage. RAID 0,1,5,10 capability gives users the ultimate in performance or redundancy. For the most demanding customers Eurocom offers the highest performance Intel and Micron SSDs including the new Intel enterprise SATA 6Gb/s Intel DC S3700 800GB HET MLC SSD.